This beautifully painted wooden transporter truck with trailer and fold down ramp is designed to carry two construction vehicles, a roller and a digger. With the cab attached to the trailer with a wooden peg, there is great flexibility in its movement and the cab can be detached quickly and simply. 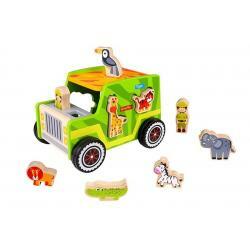 Children will love playing with this sturdy, brightly coloured wooden safari jeep which comes comple..
A beautifully painted wooden truck with car carrying trailer to transport cars!The top floor of the ..
Load the numbered containers one by one! The crane swings from side to side and the magnetic catch ..